Telling stories is the heart and soul of what we do. Whether we are documenting the love and joy of a wedding day, a young family playing with their children, or a new baby arriving into this world... we are not "just photographers". Anyone can take a photo. Most of us have a camera nearby (our cell phones) nearly 24/7. But what makes professional, candid, documentary, creative photography so special? We are trained in more than just "how to take pictures". We are professional storytellers. We are experts in reading a situation, anticipating "moments", finding the best light and capturing the very essence of our couples, their families, and anyone else we are blessed to capture through our lenses. We invite you to experience some of our favorite moments.... as told through both photos and the story that goes with those moments. After 19 years, they finally said "I Do"
Kristin and Marlon's wedding day was anything but ordinary. These two lovebirds had been waiting for this day for over 19 years. And in true Kristin and Marlon fashion, they opted for a low-key, beautiful, intimate wedding celebration. 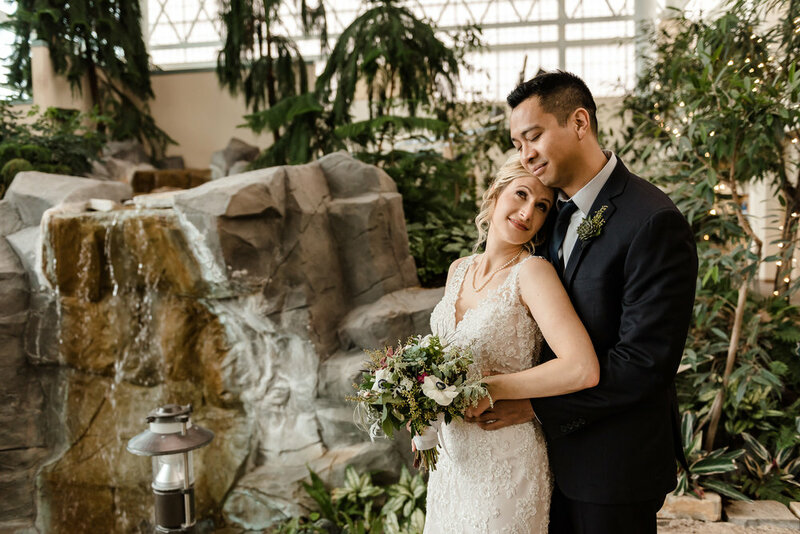 They decided to elope near their home in Woodbury, at the Central Park conservatory. They shared their relaxed, love-filled day with only a few family members. 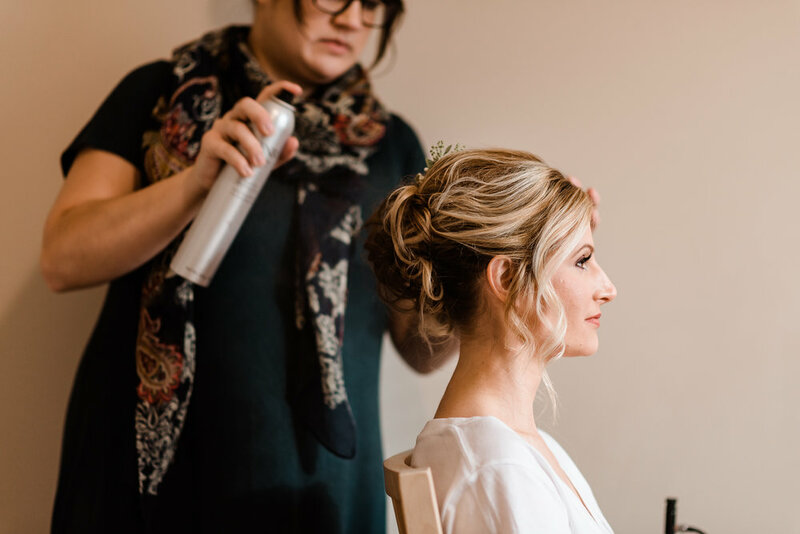 The bride and groom got ready at their home and then headed to Central Park. As Kristin descended the stairs, you could see the glee on Marlon's face! After some quick portraits, it was time for them to FINALLY tie the knot! After a short, beautiful ceremony, they shared their first kiss as husband and wife. Cheers erupted from their family members, and Etta James' "At Last" began to play from the speakers. Kristin and Marlon shared their first dance as husband and wife on the spot that they said I Do. 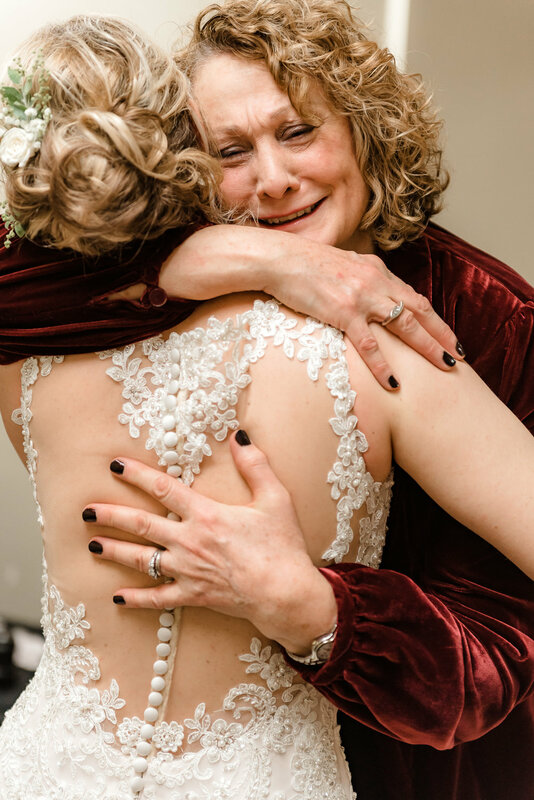 A quick glance over at Kristin's mother, Donna and she was overwhelmed with joy that her baby girl was finally a Mrs -- "I can't believe it finally happened!" Moments later, Kristin was glancing in awe at the new ring adorning her left hand... after all this time. To witness the love that these two have for one another is truly a privilege. What an honor to document their day! There was someone very special missing from Katie + Matt's wedding day -- Matt's father, Verd. He had passed away tragically several years prior. Katie and Matt's July wedding fell on one of the hottest days of the year. 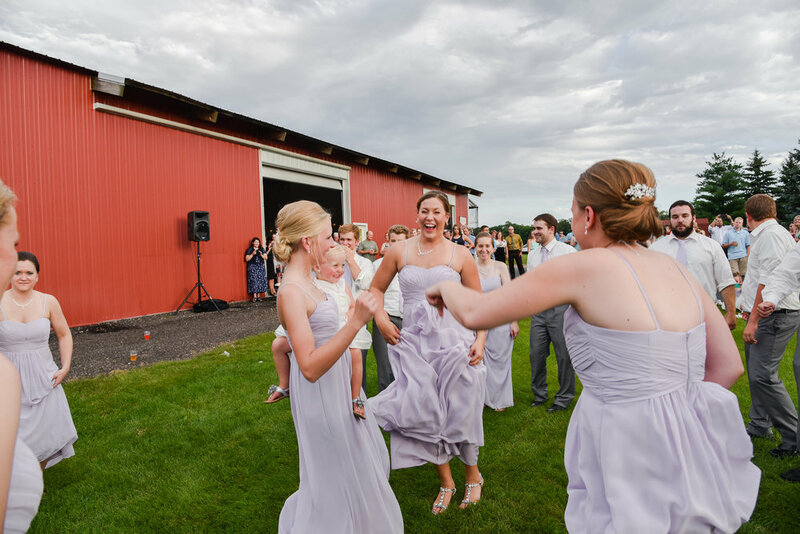 Their reception took place at Katie's family farm, where her family had converted a big shed into a wedding wonderland, complete with air-conditioning. But when the 90+ degree heat pushed the generator a bit too far, a fuse blew and the previously comfortable shed became unbearable. They chose to start with their speeches inside the shed, but when it came time for their first dance, Katie and Matt opted to move it outside (where it was, in fact, about 10-15 degrees cooler as the sun began to set). Under the wide-open sky, next to their big red shed, as their guests, family and friends stood around them.... they danced. As they danced, some clouds were moving through, and during their song, a heart appeared in the clouds, as it to bless them and their marriage. 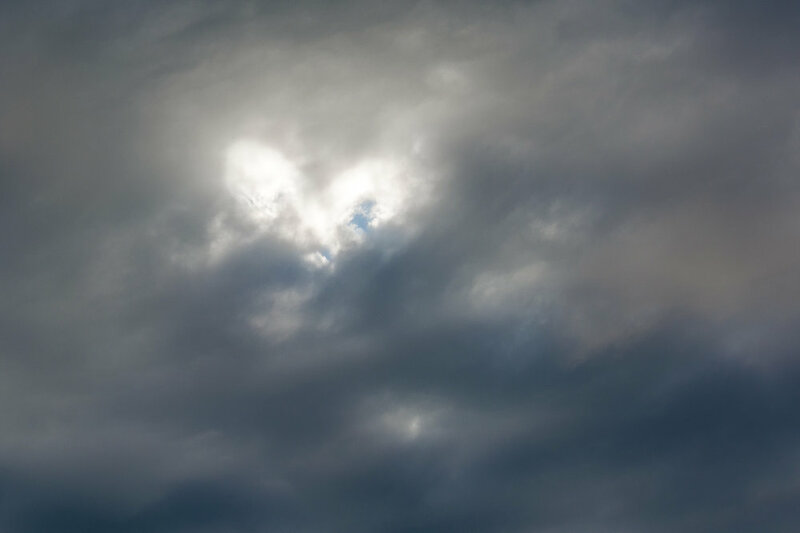 Unknown to us, Matt's mother Karen (Verd's wife) also saw this heart appear in the clouds. When Laura mentioned the heart in the clouds several hours later (and the photo captured), Karen began to weep. "I can't believe you caught that... I know that was Verd. He is here with us today and I know he would be so proud." ....and if the generator hadn't blown a fuse, their dance never would have happened outside. And nobody would have seen that heart in the sky. It was truly sent from above. 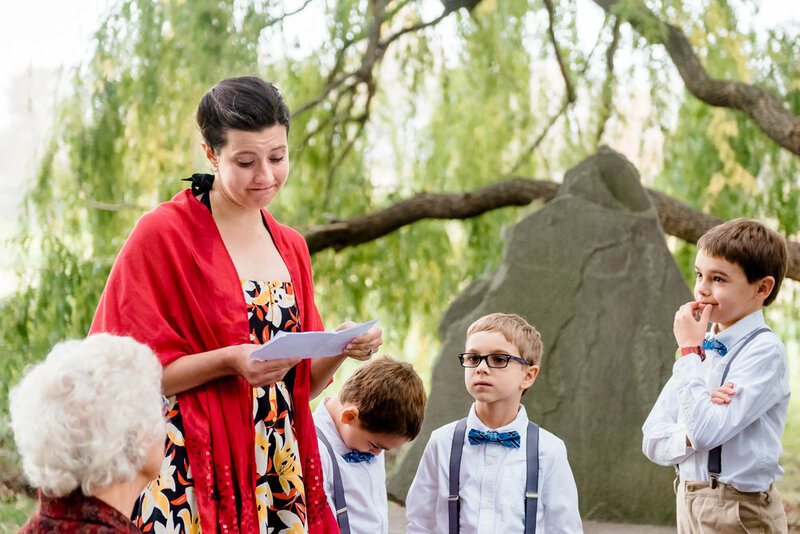 Caroline and Zach celebrated their marriage under the branches of a giant willow tree at the Minnesota Landscape Arboretum. But they chose the maple leaf as the symbol of their day, representing the sweetness and wonder of love in every day life. The two were blending their families, Caroline and her daughter, and Zach and his three sons. 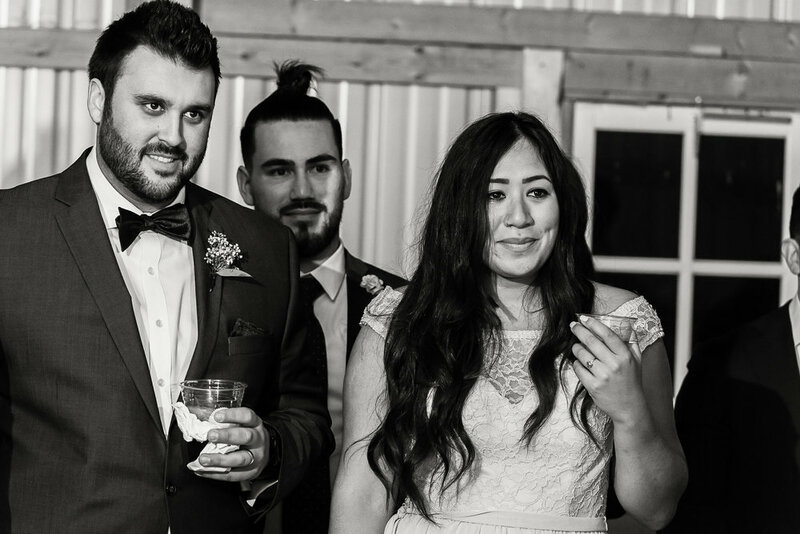 Their intimate ceremony was incredibly unique and meaningful to them, as each family member played a role in the ceremony. Together, Caroline and Zach made promises to their children, and in turn, the children also made promises to their parents and to one another. 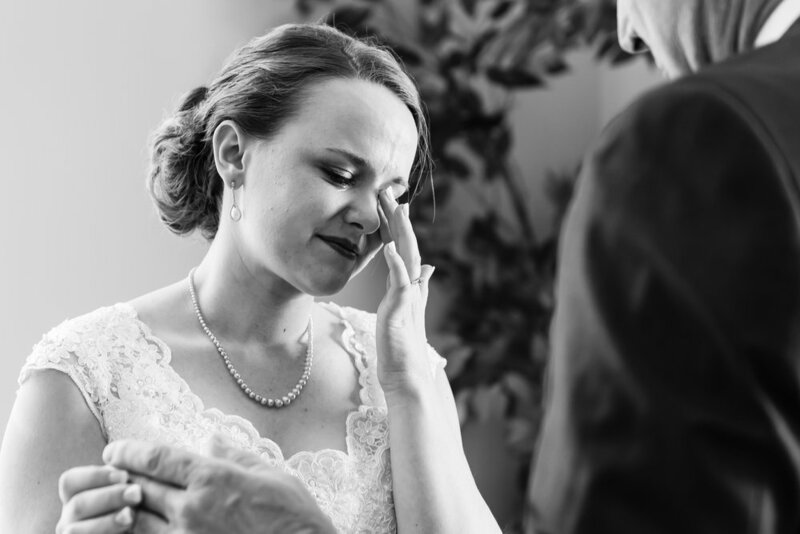 The most incredible moments though, came when the couple had select family members read meaningful poetry and prose to symbolize their love and commitment to one another. 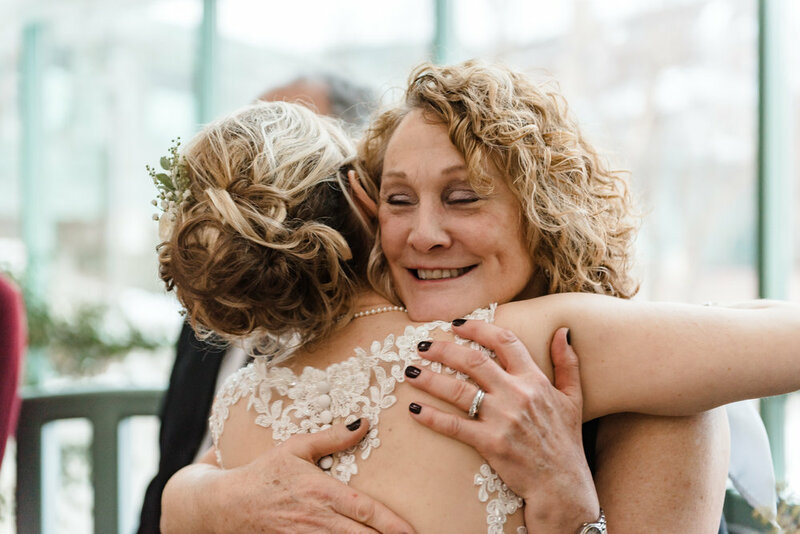 Because the couple knew that it would be incredibly emotional for them, they opted to have the bride's sister read their promises to one another as they held each other tight and gazed lovingly into one another's eyes. 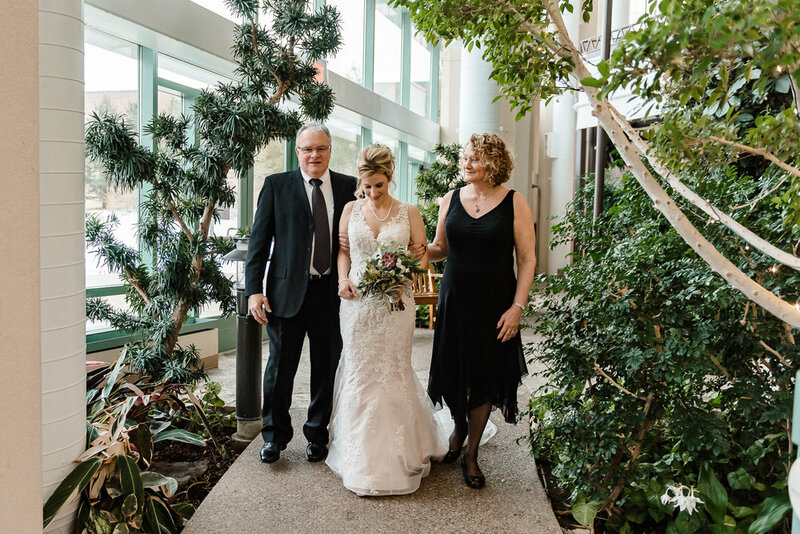 The couple opted not to exchange rings, and instead, both parents and the children all received matching maple leaf necklaces. As they sealed their love with a kiss, the children rushed around them and surrounded the couple in a giant family hug. 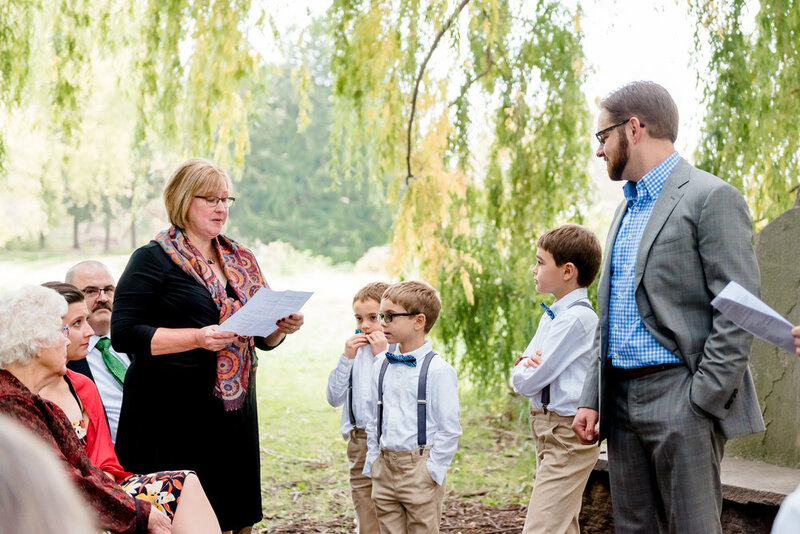 The family also took photos under a large, golden Maple tree at the Arboretum as a lasting impression of this incredible day when their family became one. ...As Long as the Stars are Above You. And Longer If I Can. When two families join together, it is more than just a marriage between a husband and wife. Sometimes, there are children involved. And when Cody + Matt blended their two families into one, they shared an intimate backyard wedding with just their very closest family and friends. The bride's 16-year-old daughter had a gift for singing and had planned to sing the couple's first dance song, Ellie Goulding's version of "How Long Will I Love You". But before she began to sing, Caelyn had a message for her new dad. As she described her difficult relationship with her own father, she thanked Matt, and gave an incredibly heartfelt speech about how he had showed her what a real father was, and what real love meant. ...Not a dry eye in the house, including this photographer. When she began to sing, Cody + Matt shared their dance under the cafe lights, wrapped in each other's arms. Wedding days are just as much about the new families forming as they are about the husband and wife. And there was an abundance of love in the air on that July evening on a little lake outside of Duluth. Back in 2014, we were blessed to photograph Anna and Joe's engagement, wedding day, newlywed session and now.... their long-awaited maternity session. These photos don't just show snapshots in time... they are moments, memories preserved forever through our lenses. These photos show a family starting, and growing. They represent the love, the faith, the loss and the anticipation of a new baby and the fertility issues that led them to this precious rainbow baby. 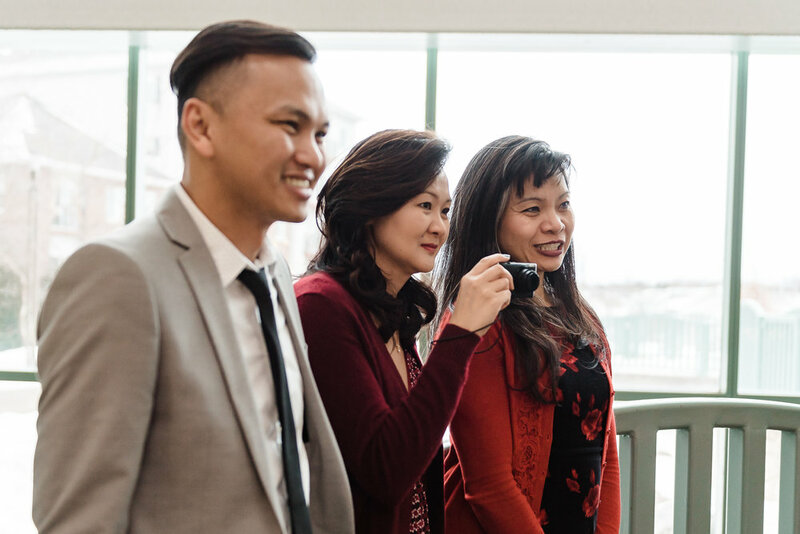 Whether for engagement, wedding day, newlywed, maternity, birth, newborn, or family photos... whatever you need, we'll be there to document the most memorable moments of your lives -- it truly is an honor. 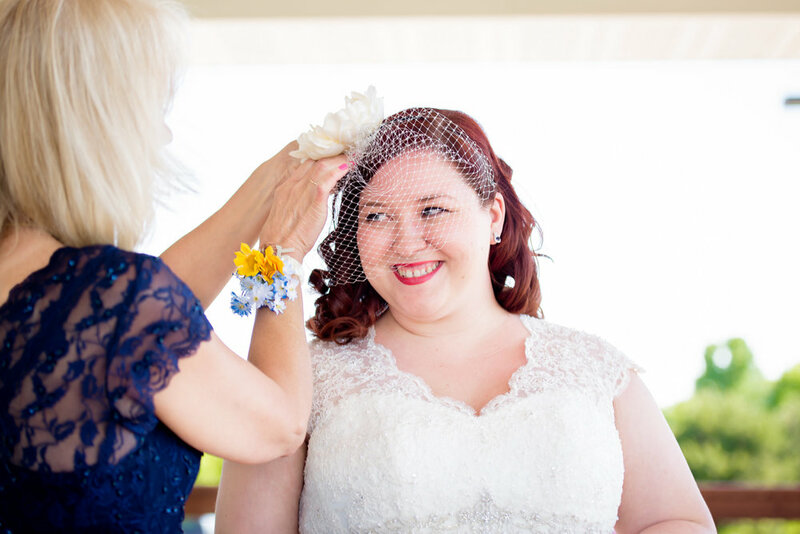 For Dana and Stephen, their romance was whirlwind and straight out of a romantic comedy script. He was a California boy and she was a Minnesota girl. Their mutual work for an insurance company brought these lovebirds together. 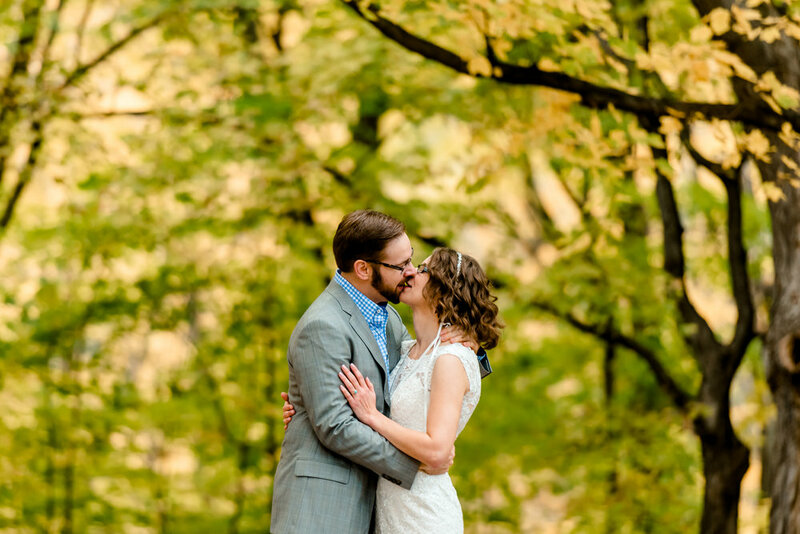 Their happily ever after began at the Minnesota Harvest Apple Orchard on a beautiful October day. The groom had wanted to surprise his beautiful bride, and he co-wrote a song for her with his twin sister's fiance. The morning of the wedding, his soon-to-be brother-in-law sang and recorded the song they co-wrote... all the way over in Djibouti! He was a deployed Marine serving there at the time (so, 7,600+ miles away from Minnesota) and was unable to be at the wedding to celebrate with them. After all of the traditional dances had completed and the party was raging on, it was time for us to begin packing up. Joe, the best man, stopped us and promised something really neat was about to happen, that "you don't want to miss". They hooked up an iPad to the DJ's soundboard and a beautiful song began to play... it was sung and recorded that morning, all the way over in Africa! The lyrics spilled into the air as the crowd watched them sway, mesmerized as they danced. 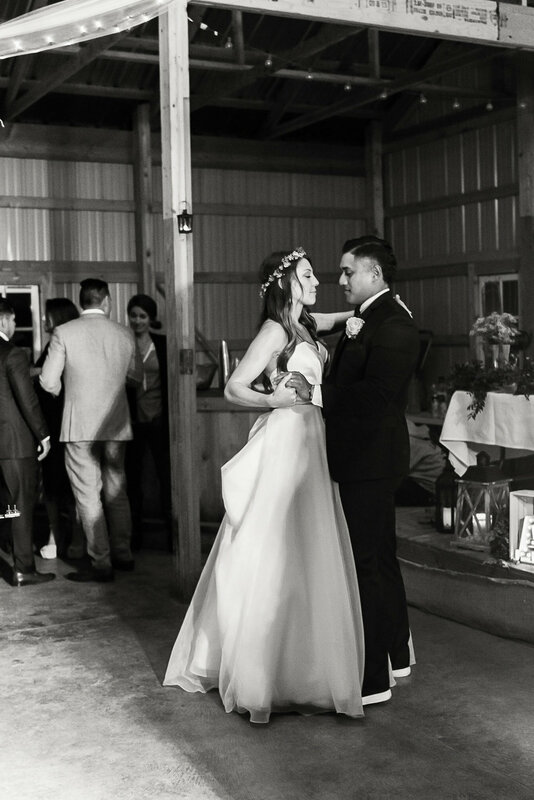 This sentimental, transcontinental serenade was a moment none of us will soon forget! 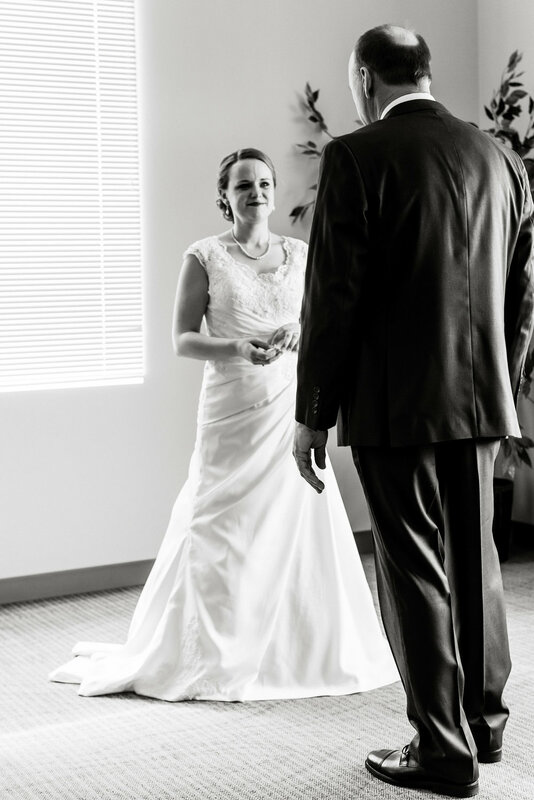 For the father of the bride, a wedding day is a bittersweet reminder that his little girl is all grown up, that she will count on and look up to her husband from this moment on. Though she'll always be daddy's little girl, in the moment he first sees her, it's as if a lifetime flashes before his eyes. Samantha had just put on her wedding gown and it was time for her father to see her for the very first time. He had closed his eyes and was led through the church hall to stand in front of his daughter for the first time as a bride. Once he opened his eyes, a lifetime of love came to a head in that moment. He saw his baby girl, all grown up and about to marry her soul mate. And the tears burst forth within an instant of seeing her in her gown. They shared an incredibly emotional moment together, as mom watched nearby. Not a dry eye in that room (myself included). Such a special moment for both of them, and for us to experience and document for them. Who says that you have to slice and eat the wedding cake all nice and dainty? 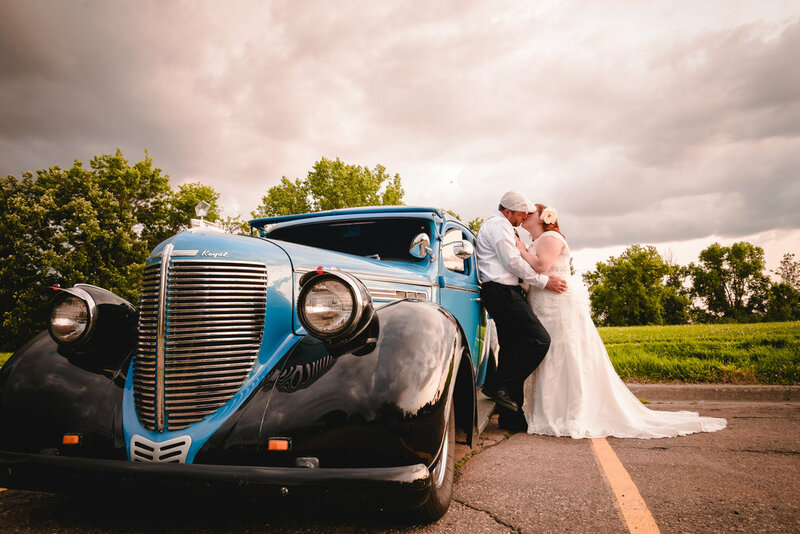 Rob and Lisa took their wedding fun to a whole new level! Instead of a "dollar dance" (a lovely Midwestern wedding tradition), the bride and groom opted to "compete" for the most cash in the jars as Team Bride and Team Groom -- and the winner at the end of the evening got to smash cake into the loser's face. .... As if poor Rob ever stood a chance. Now THAT is the way to have your cake and eat (or lick) it too! 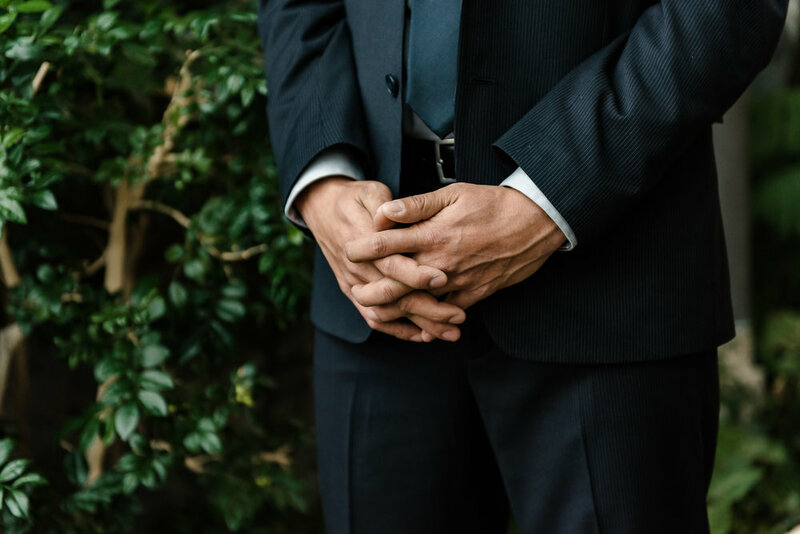 It all starts with "yes...."
Ready to connect? So are we! And we are so thankful and blessed that you would consider us to tell your story.